On arrival on site, an explanation of the work that is to be carried out is given to the site supervisor. Risk assessments and method statements can be shown if required. 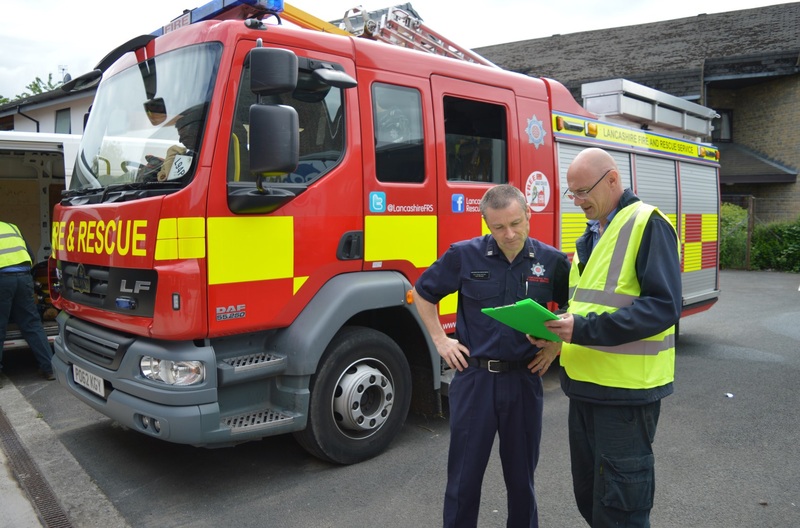 Once everyone is happy with the work to be carried out, the only requirement is a hydrant or suitable water supply. The equipment is set up, hoses are coiled onto the drums and hydro-statically tested. There are many advantages to testing using this method, the main ones being it has a much smaller footprint than “on the ground” testing and stops people being at risk of injury in the event of what we would class as a “catastrophic” failure. Normally with a failure of this type you would expect the hose to whip. The water exits the hose with such force that the hose contracts dramatically, around 2 meters in a matter of milliseconds. If not properly anchored the hose can become airborne with the obvious potential to cause injury. 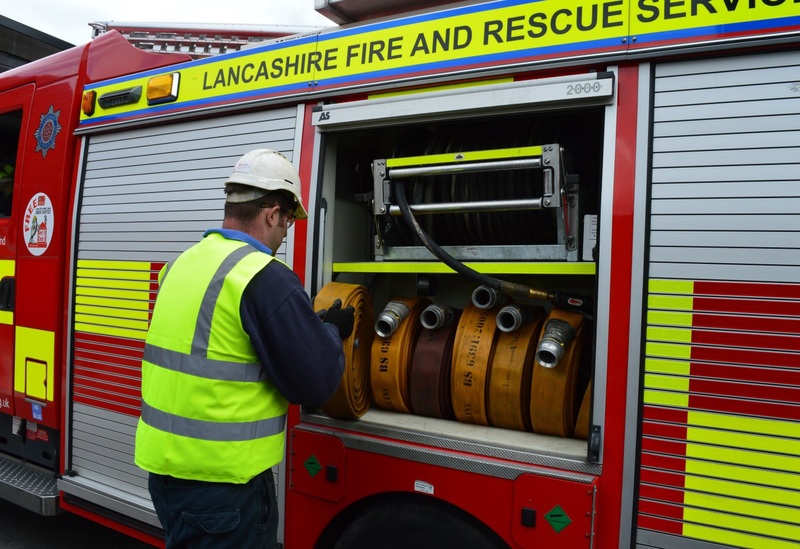 When using the Fire Hosetech testing system, this type of risk is minimised as the hose grips onto the drum and the water evacuates safely. A secondary advantage of this method of testing is that it becomes much easier and less physically demanding for the operative to visually inspect the hose for any evidence of abrasion or cut damage. Hose testing is the heart of Fire Hosetech’s business and we have been testing and repairing some client’s hoses annually for the last 25 years. Hoses are tested in accordance with BS6391:2009 which stipulates an annual test pressure of 1.5 x maximum working pressure. Dependent on the customer’s requirements we hydro-statically test hoses at between 12 and 22.5 bar (174 - 326 p.s.i. )Hoses that fail the test have areas of damage marked for repair, unique asset marks/numbers are recorded and logged on a spreadsheet and the failed hoses are set to one side. Following a successful test, the hose is drained of water, recoiled and a coloured cable tie is attached to the male coupling to indicate that the hose is in test. The hose is then re-stowed on the vehicle. All hose details are entered on a spreadsheet for the record. Once all testing is completed, a certificate is issued detailing the unique identifiers of the hoses that passed. The asset no./identifier acts as the key to all the other information record-ed about the hose such as hose type, length, diameter, coupling make and age, test dates and history, giving a complete and comprehensive set of records in the event of an incident or accident. This record is also very useful when budgeting for replacement hoses. In addition to all the above, as manufacturer of the Stenor/Merlin Hose Repair System, Fire Hosetech are experts in the repair of damaged hoses which can massively reduce the cost of failed hose tests as the hoses can often be repaired and retested for a fraction of the cost of a new hose. New couplings can be wired on professionally fully in accordance with BS6391:2009 and female couplings can be serviced as part of the testing regime if required.